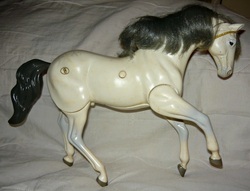 Destino-1984 gray (black base). Sired by Leopardo II (r), out of America T (I.T.I.) (r). Bred by Shadow Wolf Stables and adopted from them. 1992-SWS The Destiny of a Legend, gray colt (x Leyenda) o/b Thunder Mountain Stables. 1999-Fantasmo, gray colt (x Andanza) o/b Shadow Wolf Stables. Misterioso-1992 black. Sired by Axis/Ingrato IX-r, out of Atenea IX-r. Adopted from Celtic Song Stables. 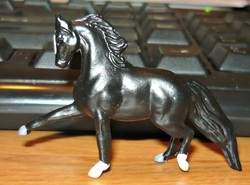 Desperado-1992 gray (black base). Sired by Delorean, out of Oficiala-r. Bred by Celtic Song Stables and adopted from them. 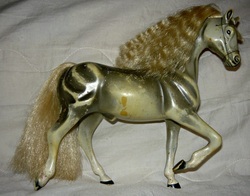 Homo for Gray so will also drop a gray foal. 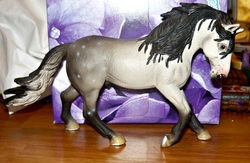 Dazzling Spirit-2000 gray (black base) PRE stallion. Sired by Ceniciento SWS, out of Paz. Bred by Shadow Wolf Stables. Nube-2010 gray (bay base). Sired by Deserado, out of Tormenta.